How much time do you spend trying to get better at using your imagination? Do you think it’s one of those things you’ve either got or you haven’t? One way of fuelling your imagination is by feeding yourself things from outside of you: listening to music, reading a book, checking things out, taking things in. Another way is by pulling it out of yourself. A good way to work on this is if you limit what you apply your imagination to. Anyhow, in trying to get to the limit of your imagination and pushing on, you may find something you hadn’t thought about before. Maybe something that no-one has thought of before. Spend time trying to imagine new ways to do it. Another less exhausting exercise is to let your imagination rule. Your imagination is a slave to what you know is possible in the real world. For example, I have these hands, this instrument, my technique, my knowledge, ten fingers, two arms, the person I am, these opportunities, and so on. But in your imagination, you can do whatever you want; whatever you can dream. You can picture yourself with three arms, making sounds made of liquid, playing to an audience of bats. You can try to imagine things that you can’t imagine. Now that’s a GRRRRREEEAT exercise for your imagination! You can give yourself the problem of making something that you can’t possibly do real. But maybe you can do it. Maybe you’ll spark an idea. Maybe you’ll open a path to something new. 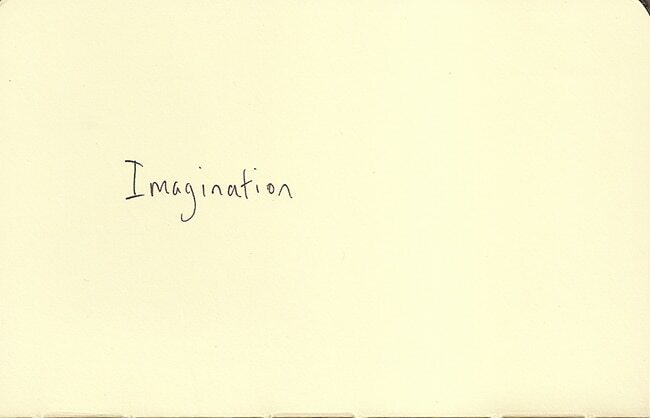 But first of all, you have to think of imagination as something worth paying attention to.